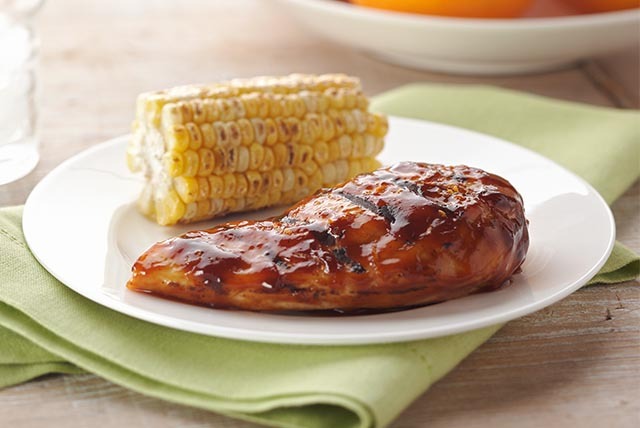 Pair Easy Barbecue Chicken Breasts with grilled corn for a quick Healthy Living dish! Our easy barbecue chicken includes orange zest for extra flavor. Mix first 3 ingredients. Reserve 1/2 cup sauce mixture. Pour remaining sauce mixture over chicken in shallow glass dish. Refrigerate 30 min. to marinate, turning after 15 min. Heat grill to medium heat. Remove chicken from marinade; discard marinade. Grill chicken 5 min. on each side. Brush with reserved sauce mixture; grill 4 to 6 min. or until done (165°F), turning and brushing occasionally with sauce mixture. Prepare using KRAFT Sweet Honey Barbecue Sauce. Serve with Grilled Corn on the Cob. Chicken can be marinated and refrigerated overnight. Drain, discarding marinade. Grill as directed. Your entire family is sure to love this barbecued chicken that can help you eat right!